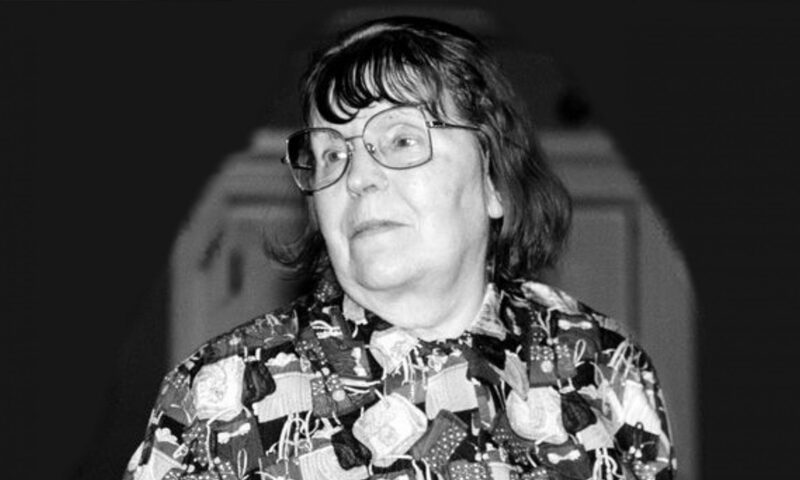 Galina Ivanovna Ustvolskaya (1919 – 2006) was a Russian composer whose sui generis body of 21 austere, brutally direct works stands among the most uncompromising statements of 20th century classical music. A student of and influence to Shostakovich—who was “convinced that the music of G. I. Ustvolskaya [would] achieve worldwide renown, to be valued by all who perceive truth in music to be of paramount importance”—she later denounced her teacher’s music as dry and soulless, claiming “there is no link whatsoever between my music and that of any other composer, living or dead.” Working under Soviet constraints, Ustvolskaya weathered a socialist realist period of compulsorily created and soon-disowned populist music, but from 1963 onwards devoted herself exclusively to what she termed “true, spiritual, non-religious creativity.” Her penchant for the use of piano or percussion to insistently beat out regular, unchanging rhythms as the basis for relentless homophonic blocks of sound earned her the title “the woman with the hammer,” while her narrowness and obstinacy of vision have been compared to that of a laser beam. Although she preferred to write for small groups of frequently unusual instrumental combinations, Ustvolskaya regarded even the chamber music of her obsessive ascetic works as being orchestral in scale and intensity. A St. Petersburg hermit who came to refer to her works as “music from the black hole,” Ustvolskaya as a rule rejected commissions, remaining a cult figure until concerts at the 1989 Holland Festival catalyzed widespread recognition, leading to a number of international Ustvolskaya festivals. Ustvolskaya’s spiritual pessimism is perhaps nowhere better expressed than through the six piano sonatas she wrote between 1947 and 1988. While the early sonatas betray an influence from Satie’s dissonant Rosicrucian period, the final two are suggestive of extreme violence. Chord clusters marked with ffff dynamics are accompanied by the tempo indication Espressivissimo, directing the pianist to enter a state of intense expression while performing a piece so physically demanding that pain and suffering are inevitable. Swiss pianist Marianne Schroeder, once considered by Ustvolskaya to be one of two musicians capable of playing her music, in 1994 laid to tape the definitive recording of Ustvolskaya’s piano sonatas, released in 1995 by hat Art. In a 1988 letter, Ustvolskaya wrote “Although my compositions are not religious in the strictly liturgical sense, they are filled with religious spirit, and I feel that they sound best of all when performed within a church environment, without musicological prefaces and analyses.” Responding to Ustvolskaya’s unfulfilled desire that Schroeder play all six of her piano sonatas in St. Petersburg’s best music hall wearing a black dress, Schroeder performs the pieces, uninterrupted, at St. Peter’s Episcopal Church, preceded by the composer’s 12 Preludes. Artistic director of the Giacinto Scelsi Festival in Basel, Marianne Schroeder is a Swiss composer and pianist specializing in the interpretation of New Music. She has collaborated with and premiered work by John Cage, Karlheinz Stockhausen, Terry Riley, Christian Wolff, Anthony Braxton, Morton Feldman, Pauline Oliveros, Maryanne Amacher, and Giacinto Scelsi, with whom she studied. She is currently a professor at Hochschule der Künste Bern, and has also taught at the International Summer Courses in Darmstadt. In 2017, Blank Forms presented the American premiere of Maryanne Amacher’s 1991 piece Petra, performed by Schroeder with Stefan Tcherepnin. A recording of the performance, on LP and CD, is forthcoming this April from Blank Forms Editions. With kind support from the Consulate General of Switzerland in New York and Yamaha Artists Services. Bösendorfer 280VC concert grand pianos are provided by Yamaha Artist Services, New York.